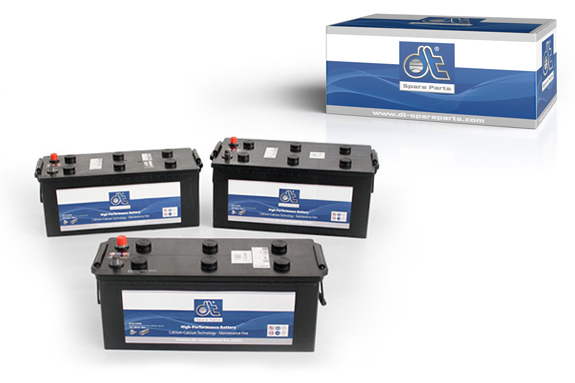 The high performance starter batteries from DT Spare Parts are universally usable and cover 95% of commercial vehicle applications. They always provide a cold test current of up to 1150 A/EN for the startup routine under all climatic conditions. Before replacing a battery, an error diagnosis can indicate the cause of the failure. A defect on the vehicle is also possible. External loads are identifi ed through a closed current test. The problem can already be solved by cleaning the battery pole mount and/or applying acid-free grease. To obtain the full power, all batteries of a system should be replaced at the same time. It is important that the installed batteries have the same capacity. Please note: The protective cap from the positive pole should only be removed before connection. The positive pole is connected before the negative pole. Fasten the pole clamps securely. Removal is done in the reverse order. Always store batteries in a cool and dry place.